The X-ACTO precision knife is the original cutting tool for any application requiring a precise, accurate cut. This cutting and trimming tool has been used for years by graphics artists, designers, hobbyists and others for making careful cuts and trims consistently and with confidence. 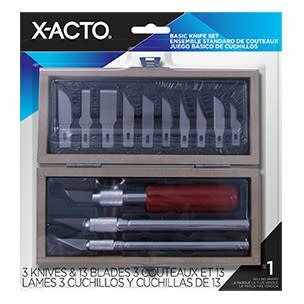 Now you can purchase the original X-ACTO knife (#’s 1, 2 and 5) along with a full set of X-ACTO precision knife blades, all in one convenient set, a must have for any art kit. 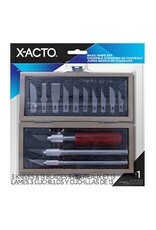 The original X-ACTO knife has been praised for more than 50 years as the standard for precision. Attaining this level of precision, accuracy and reliability starts with supreme quality craftsmanship. The X-ACTO precision knives are built with carbon and steel sharpened blades for a reliable cut every time. Add a full set of X-ACTO precision knife blades, you will have a knife to make the precision cut you need – every material, every time. Set contains: #1 Knife for precision cutting and trimming of lightweight materials, #2 Knife for precision and trimming of medium to heavy weight materials, #5 Knife for precision cutting of heavy weight materials; #7, #10, #11, #16, #17, #2, #18, #19, #22, #24 precision knife blades.